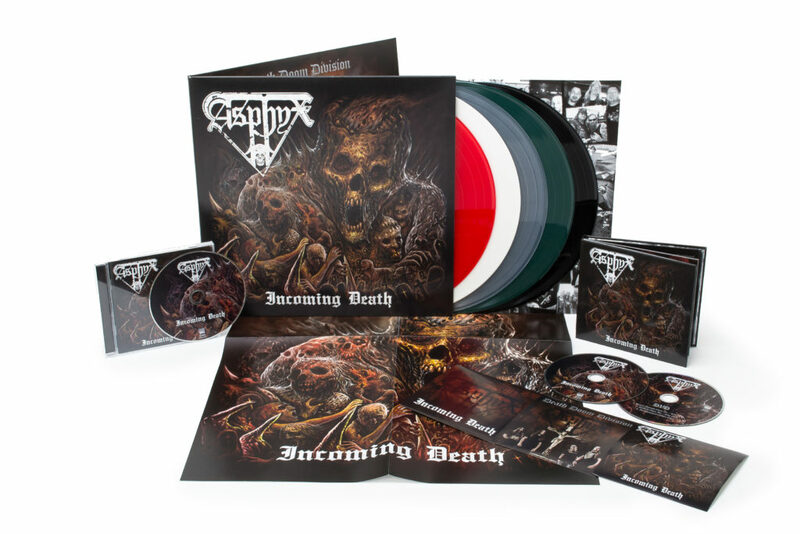 In 2012, the Dutch death doom division ASPHYX unleashed “Deathhammer” and celebrated a massive success by scoring several “album of the month” titles and even charting for the first time in the band’s history, which began back in 1987. Now, the time of wait is over and Martin, Paul, Alwin, and Husky present the even stronger successor “Incoming Death”! From short, sharp attacks (“Candiru”, “Incoming Death”) over to doom monsters with gloomy guitar melodies (“The Grand Denial”, “Death: The Only Immortal”) plus krushing mid-tempo tracks (“Division Brandenburg”, “The Feeder”), and surprising, slight Slayer references (“It Came From The Skies”, “Wildland Fire”), this is 666% ASPHYX at its pure, uncompromising best! Incoming Death is a phrase that doesn’t really exist but refers to what entrenched soldiers cry out when under severe artillery fire. Thus Incoming Death implies another relentless bombardment of monstrous ASPHYX death/doom metal! Get your copy now at CM Distro! © 2019 Asphyx Official. Theme by XtremelySocial.